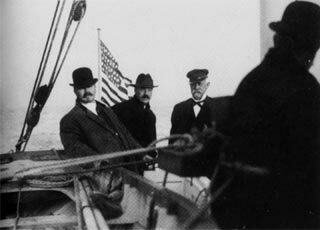 Four San Francisco Bar Pilots aboard the schooner California. San Francisco Bar Pilots continue to do their work in formal business attire to this day. 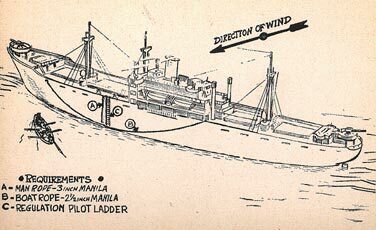 A page from the San Francisco Bar Pilots 1945 Tidebook showing correct rigging of the pilot ladder on a Liberty Ship. Seas at the San Francisco pilot station frequently run over 8 ft or more. Boarding a pilot ladder in such weather requires good timing – wait for the crest of a wave to carry the pilot boat to its highest point and only then step onto the ladder, climbing to the ship’s rail while the pilot boat falls away beneath you. While in San Francisco be sure to visit the Liberty Ship S.S. Jeremiah O’Brien. and get a sense of the daily life of merchant seaman during WWII.